Prominent & Leading Manufacturer from Coimbatore, we offer hydraulic punching machine, non woven d- cut bag punching machine and bag cutting machine. We are engaged in offering excellent quality Manual Non Woven U And W Cut Punching Machine to our valuable clients. Manual U & W Cut Punching Machines from our production come with a solid build as the materials used for their manufacture are largely meant to avoid wear and tear from continuous use. Being one of the leading suppliers of quality U & W punching machines, we regard product quality and customer satisfaction as our top priority. Owing to its operational flexibility, our machinery finds use in various production systems and also has the advantage of being compact and space saving. Our wide range of manual U & W Cut Punching Machines is a result of years of experience in the field. Despite being manually operated, the ease with which our manual punching presses can be operated is incomparable. Consistent innovation, coupled with an alert understanding of customer's needs & demands, makes us the most renowned supplier of Non Woven D- Cut Bag Punching Machine. The provided machine is strongly built with premium quality components and progressive techniques under the stern direction of dexterous professionals. We assure that the offered machine is outstanding on counts of performance and excellent working life. Keeping in mind the different needs of our clients, we offer this machine to our clients in various specifications. We have gained specialization in providing our clients an exclusive range of Bag Handle Cutting Machine. In adherence to defined industry industry guidelines, we manufacture this machine employing quality assured components and latest techniques. Our offered machine is used to cut non woven bags loop handle in different sizes. Our in-house quality checking unit enable us to supply flawless machine at our clients’ end. Our clients can purchase this machine at a reasonable price. 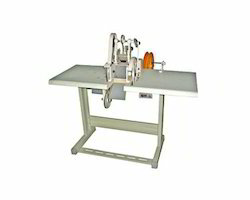 Looking for Nonwoven Bag Handle Cutting Machines ?